Can Maryland make it two in a row or is it Albany's time to shine? This weekend, the 2018 NCAA Men’s Lacrosse Tournament gets underway* and for those who have a passing interest in the sport or, like with ice hockey, only really start paying attention once the regular season is over, you’ve got a lot of catching up to do in order to know what you’re looking at. Before you tune in to watch the first round on Saturday, May 12 and Sunday, May 13 on ESPNU and the WatchESPN app, here are the seven things you need to know. That asterisk up there is for the fact that the NCAA Tournament now includes a play-in game, which is very on trend for college tournaments. The Northeast Conference champion Robert Morris Colonials (13-4) put a beating on Metro Atlantic Athletic Conference champion Canisius Griffins (8-9), holding them scoreless for a 28:35 stretch en route to a 12-6 victory. Their prize? A showdown with the defending national champion Maryland Terrapins. The last time a No. 1 seed lost their opening game was back in 1999 when Loyola lost to 8-seed Syracuse. So while it’s not unheard of, it’s also not very likely that Bobby Mo will be moving on. For a long time, Maryland garnered a reputation as a good lacrosse program that was never great. After winning the national title in 1975, they wouldn’t do it again until last year. Between those two, they lost in the national title game nine times. Funny how winning a title changes the script, as now the Terps can say they’ve been in the title game in five of the last seven years. As the No. 1 seed, they’re favored to get back there once again, and with elite players like Connor Kelly and Jared Bernhardt, it’s hard to bet against a repeat. There’s been a lot of talk in recent years about how college lacrosse has evolved and opened up. It’s no longer a sport that only six or seven schools have any chance of ever winning the title. It’s more democratic now. Well, that’s true and it also isn’t. 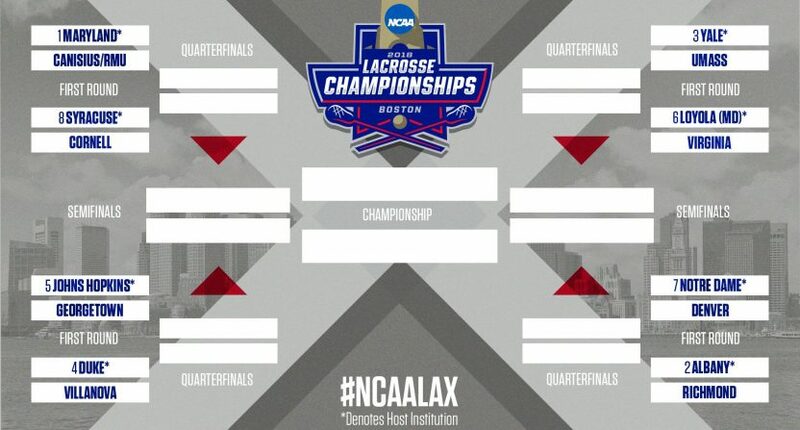 Just look at the tournament field, which features Maryland, Syracuse, Johns Hopkins, Duke, Loyola, Virginia, Notre Dame, Cornell, and Denver. Chances are you’ll find almost all of those teams in the tournament every season, so while it’s true that other programs are starting to push against the establishment and even break through to join it (such as Ohio State reaching the title game in 2017), it’s still a legacy sport. The Albany Great Danes and Yale Bulldogs are not plucky upstarts by any means. Both squads have become tournament mainstays in recent years. But to see Albany as the No. 2 seed and Yale as the No. 3 seed is an invigorating reminder that there’s always room for other programs at the top. After losing their opener, the Bulldogs rattled off 13 wins in 14 games before losing to Cornell in the Ivy League Championship. They looked overmatched in that one, but they also beat Cornell earlier in the season. As for the Danes, they opened the season by crushing Syracuse 15-3 and spent much of the season No. 1 in the polls. Two late losses (including one to Yale) tempered their top-seed hopes, but they’re still a clear favorite. If you’re pressed for time and can only tune in to watch one or two games this weekend, consider these ones. Another first-round showdown featuring classic rivals, it almost makes too much sense that they’ll play now. They opened the season with an overtime classic that Virginia won following an epic comeback. The Cavaliers will try to push the action up and down the field while the Greyhounds will look to Foster Huggins to create turnovers and Pat Spencer to turn them into goals. Chances are good we’re in for another must-see thriller. This showdown of Central New York rivals will take place in the Carrier Dome, which would imply an advantage for the Orange. But this is the weird case where the unranked team is (probably) more talented than the ranked one. Cornell won their season showdown 13-8 and Syracuse only gets a 37 percent win probability here. The Big Red will hope that Jeff Teat uses the Tewaaraton snub as motivation to make sure he’s not taken out of the action. Still, this could also be one of those throw-out-the-record-books barnburners. ICYMI, the Tewaaraton Trophy is the lacrosse version of the Heisman Trophy, named in honor of the Mohawk word for the game that ultimately became what we know today as lacrosse. They hand out that award at the end of the tournament but we already know who the finalists are. As you might expect, they’re all in the NCAA Tournament. Denver’s faceoff specialist Trevor Baptiste was named Big East Midfielder of the Year for the fourth consecutive season (Yes, Denver is in the Big East, just roll with it). He was second in the nation with a 76.9 percent faceoff percentage and third with 250 faceoffs wins. Duke attackman Justin Guterding led the nation with 56 goals and 96 points. He also ranked No. 1 in goals per game as well as ninth in assists and second in points per game. Only the second player in D-I history to record 200 goals in his career, Guterding was named ACC Offensive Player of the Year. Maryland midfielder Connor Kelly led the No. 1 team with 40 goals, 33 assists, and 73 points. Ranked first in the conference in points and points per game (4.86), while leading the Big Ten with four game-winning goals. Yale attackman Ben Reeves led the Bulldogs with 51 goals, 39 assists, and 90 points, winning Ivy League Player of the Year for the second-straight season. He’s the program’s all-time leading goal and point-scorer. Loyola attackman Pat Spencer led the Patriots League with 90 points and 55 assists, and ranked top five in the nation in points, points per game, assists, and assists per game. For his efforts, he was named Patriot League Offensive Player of the Year for the third consecutive year. Who knows? The NCAA Men’s Lacrosse Tournament is a fickle beast and many great teams have spent Memorial Day Weekend watching someone else hoist the trophy they expected to. Maryland might be the odds-on favorite given their recent history and talent, but any given weekend, weird things happen on the lacrosse field. If you bet on the correct winner, you may be able to Buy Bitcoin. Dan Arestia at College Crosse sees a Johns Hopkins grinding its way through the tournament and taking out Loyola in the title game. Matt Glaude’s yearly simulation crunched the numbers and gives Albany the best odds to remain standing when it’s all over. When you ask fans, it seems like they don’t think any of the top three seeds will get it done. The point is, as usual, we won’t know where we stand until we know where we stand. But that’s one of the great things about the NCAA Tournament. There are very few easy games and even fewer assurances.